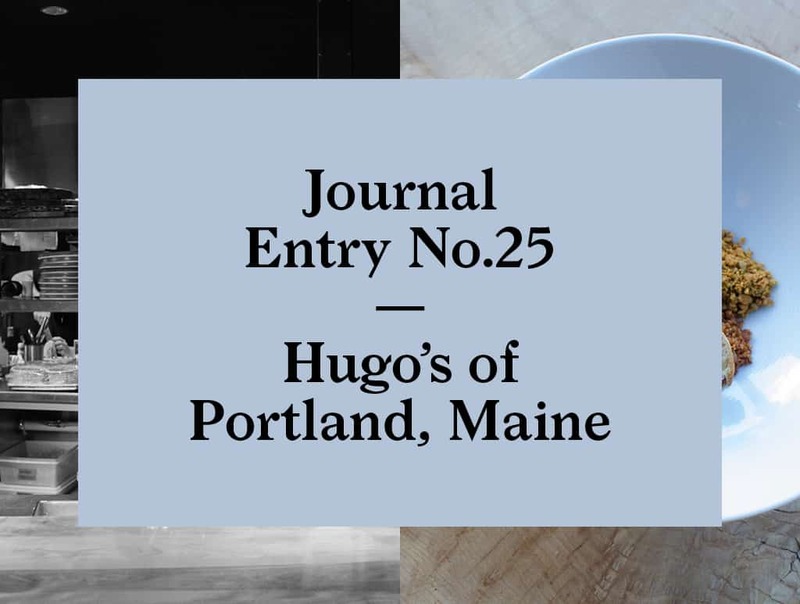 When I drove up to Maine during a winter blizzard back in January, it was a far cry from today’s balmy weather in London, where I sit tapping out my recollections of my visit to Hugo’s Portland Maine. At the conclusion of a harrowing drive, I arranged to meet with partners Andrew Taylor, Mike Wiley and Arlin Smith, who took over Hugo’s in 2012 from their former boss Rob Evans. We squeezed in our meeting early so we could get acquainted before everyone headed off to perform their respective duties in preparation for the night’s dinner service. 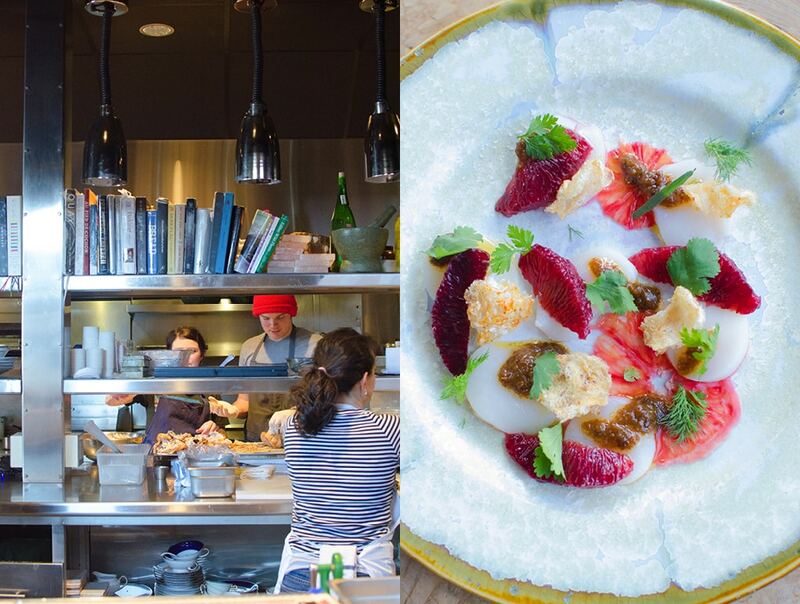 The restaurant has been located at the edge of the Old Port district since the late 1990s, when Evans opened the place and, with his flair for cuisine, quickly put Portland on the food map. 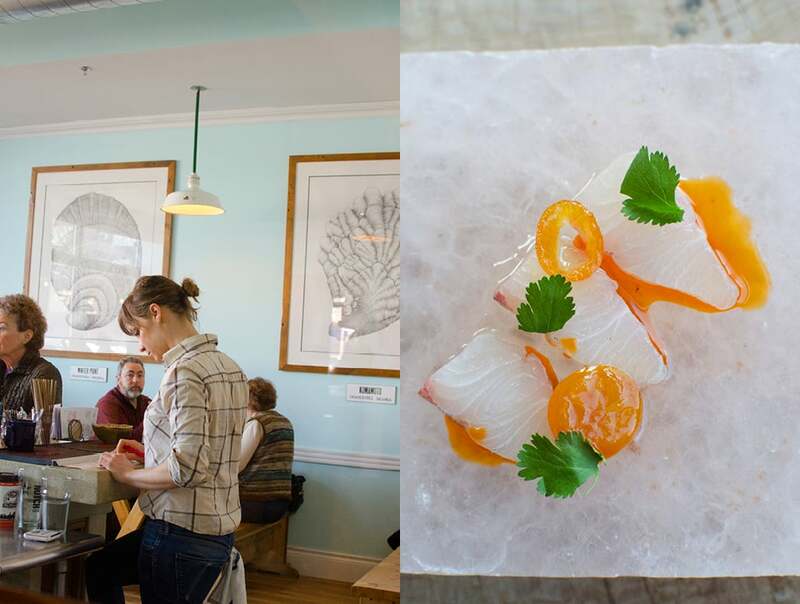 After assuming control of Hugo’s, Andrew, Mike and Arlin put their mark on the place, focusing on locally sourced seasonal ingredients, prepared simply, but in the most interesting and unexpected ways. 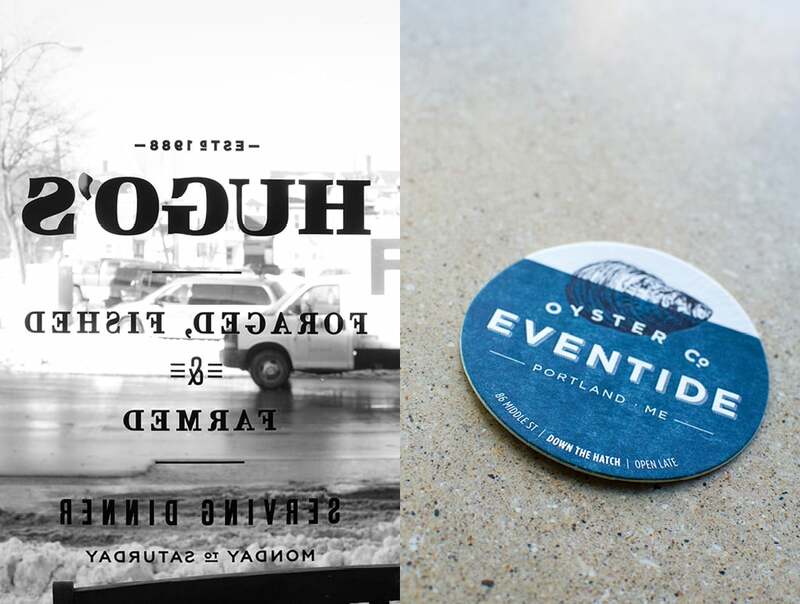 They soon parlayed their success into a second venture, an adjacent casual eatery called Eventide Oyster Company. 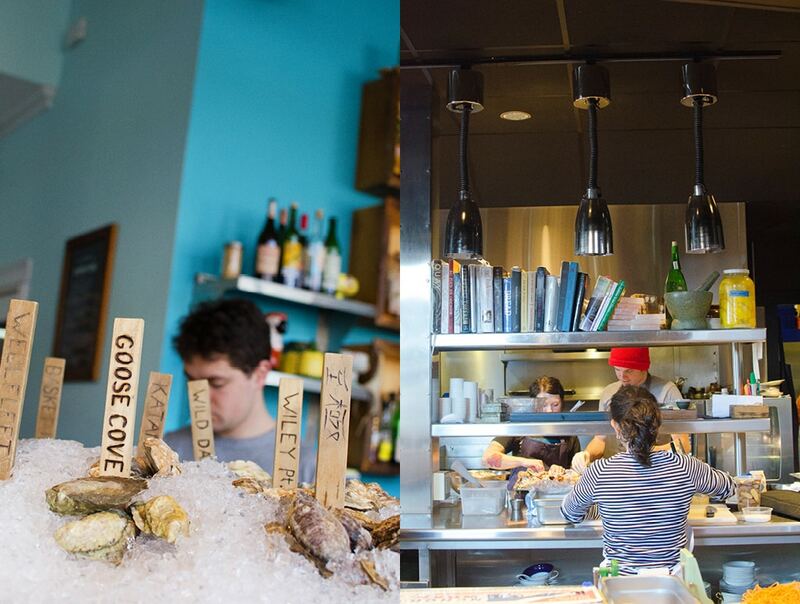 Here you can enjoy their ingredient-focused style put to work on fresh oysters, hot lobster rolls and cold beer. During my short visit I was in a good position to experience the two establishments side-by-side. 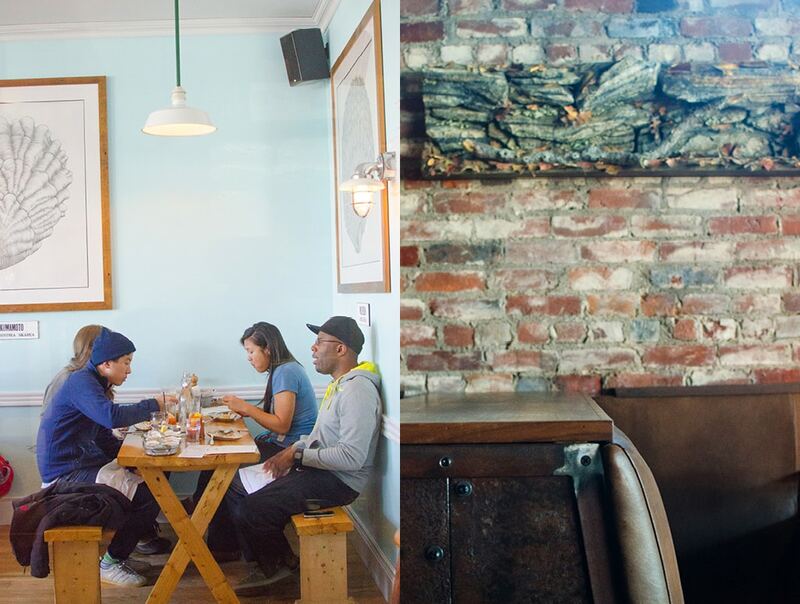 Both restaurants share a kitchen and it’s only a short hop between them. So I ran back and forth between them, talking to whoever was free, and sampling the two menus. Each dining room has a distinct style. Eventtide is light, airy and relaxed, in a “beach holiday” kind of way. 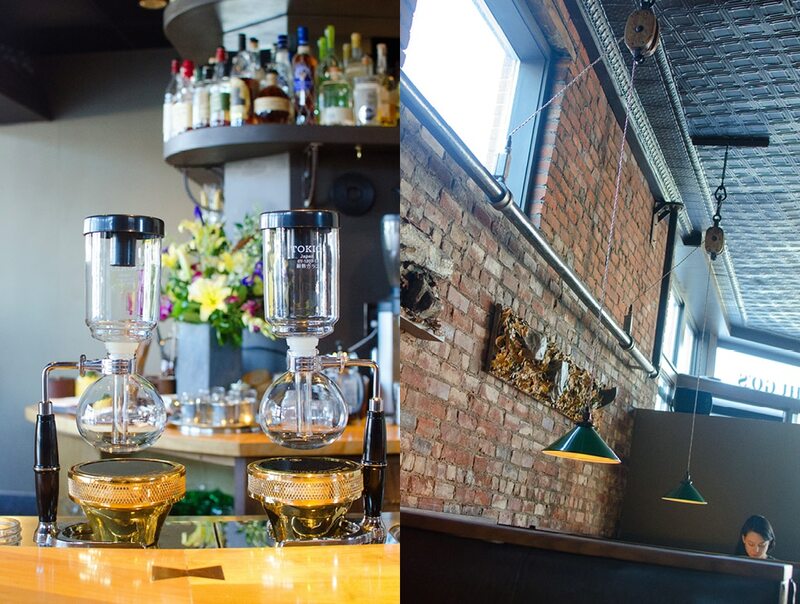 Hugo’s Portland Maine is decorated in a modern-craft style, with recycled wood, stainless steel and warm toned, slightly worn leather upholstery. 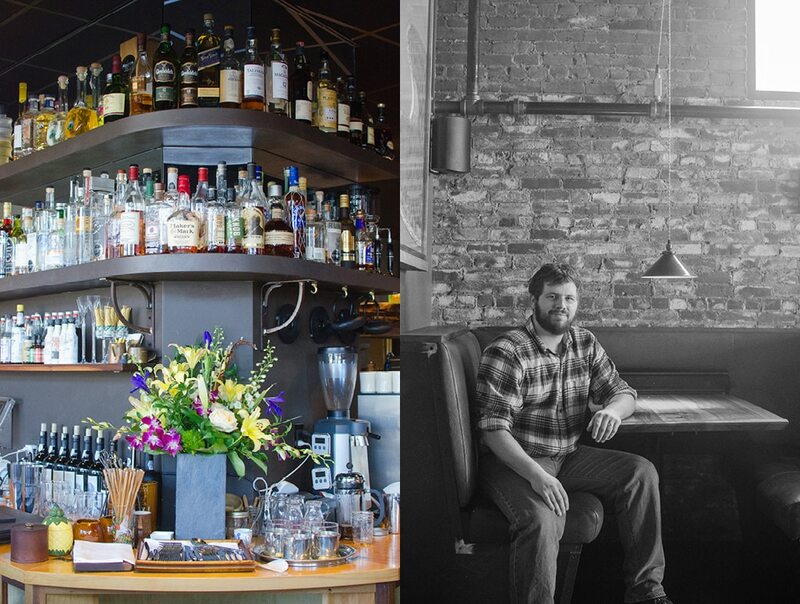 At Hugo’s, leather booths line one side of the restaurant with bar seating opposite. The kitchen is open and located just beyond the bar, so if you are at the bar you have front-row seats for the kitchen performance. 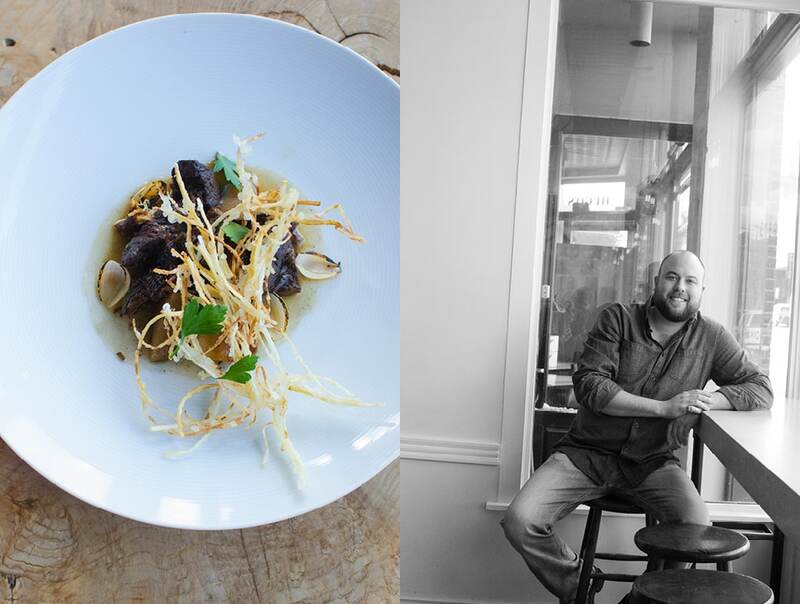 Mike and Andrew, are the chefs of the trio. They met while working at Hugo’s under Evan’s tenure. They lead a young and enthusiastic crew who all share Andrew’s, Mike’s and Arlin’s vision. 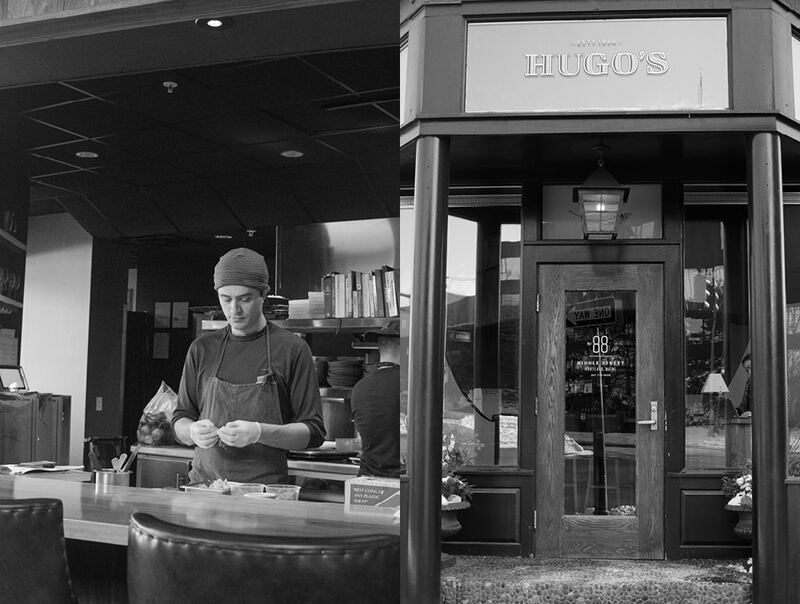 Hugo’s Portland Maine is one of those places were a clear vision, enthusiasm and a love for ingredients shapes the place. Mike started sending out plates as we chatted. First, was a poached duck egg, served with savory granola confit, beach mushroom, parsley puree and candied orange zest, accompanied by bacon on toast. It was a sensational dish. I would say the tastes and textures combine with surprising tenderness. The savory granola was an inspired touch. 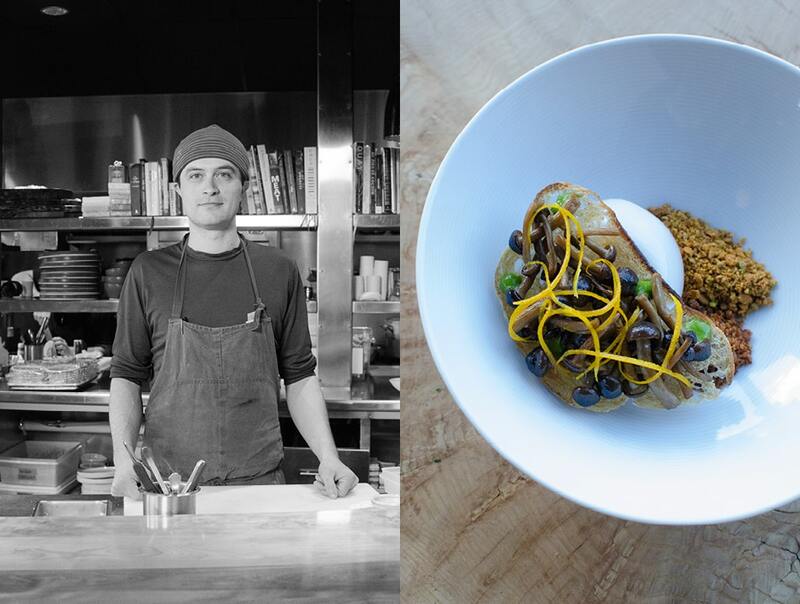 His second dish featured braised beef with pickled black radish and charred onion root, topped with a vegetable fritter made from celery and parsnip, and finally drizzled with beef juice. The slight acidic taste of the black radish perfectly balanced the dish, … outstanding. And the local sourcing goes beyond the food. 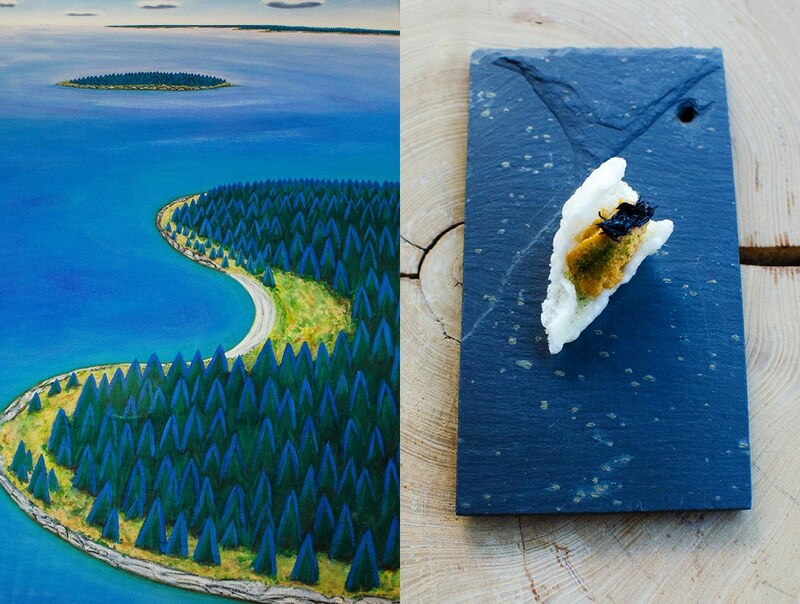 Hugo’s Portland Maine worked with local ceramic artist Alison Evans to design many of the dishes for the restaurant. Alison’s work is solid and earthy. She works with a color palette of mostly muted colors that, of course, fits in perfectly with the food and decor at Hugo’s. 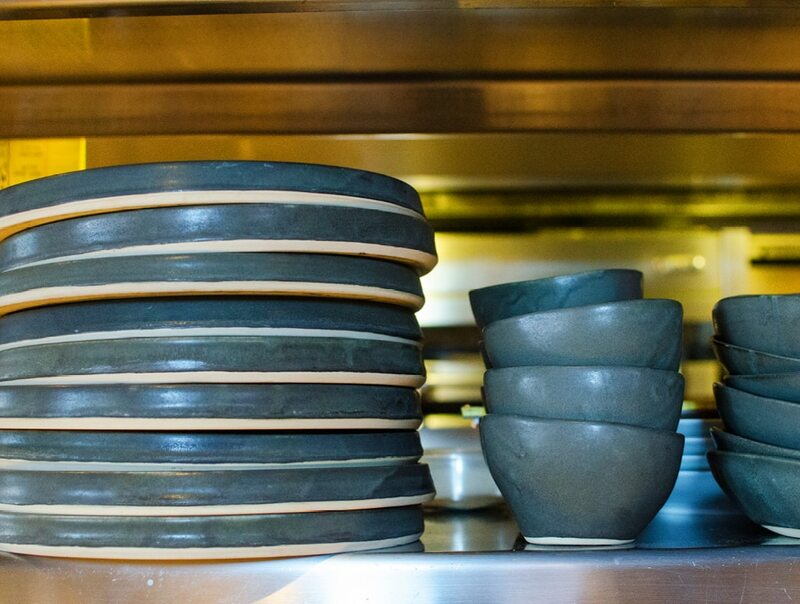 Mike always knows exactly what kind of plate he wants for a dish; texture, color, glaze, stoneware or stone. According to Mike, it’s all important for the correct presentation of a dish. Kampachi crudo came next, served with cilantro, sesame and Aglio e Olio, presented on a salt slab. Another delight. There was a sharp freshness to the dish. Mike’s final dish that evening proved to be a perfect finale for my visit: Maine diver scallops with blood oranges, served with pork-feet Chicharron. This brings “surf and turf” to new heights. I visited in winter and the crowd seemed to be mostly locals. In warmer months, the population of Portland swells dramatically so this is one time when the Bearleader advises making reservations early. 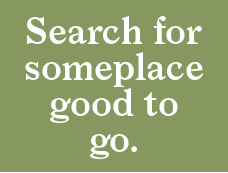 Or plan your visit off season as I did. After an extraordinary afternoon of good food and conversation, I excused myself. Inspired by the food, atmosphere and good company, and with the sun now shining again, I made my way back to New York. Thank you guys for sharing with me your great work. 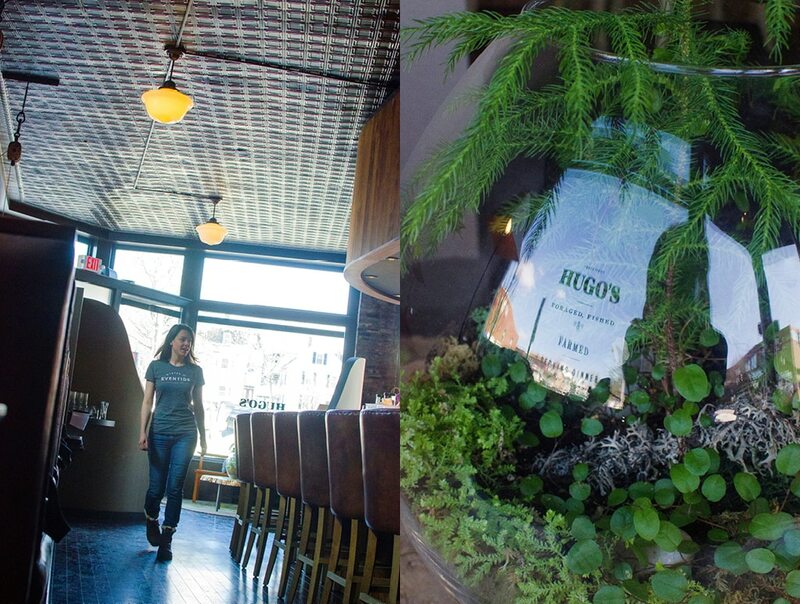 Planning a visit to Hugo’s? Here is the current weather and what to expect for the next few days.